Ruth wrote: ‘I am writing to you to urge you to ensure that Heathrow is ruled out as an option for airport expansion and as such, to ensure that Heathrow is not granted a third runway. I have been campaigning against expansion at the airport for almost 15 years, first as a Hounslow Councillor and now as an MP. In my constituency of Brentford and Isleworth and in the wider west London area, we already live in the noisiest and one of the most polluted parts of the UK. 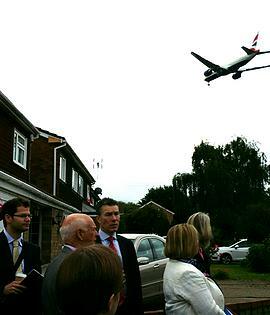 I want Heathrow to work to be a better neighbour, not a bigger one. I want to make it quite clear that I support Heathrow’s continued role as Britain’s premier world airport. Many thousands of local people work at Heathrow, it is a major driver to our local economy and is the reason so many more businesses locate locally. However success has its costs, and these are felt most acutely by those living in our area, the noisiest in the UK and also the area with the greatest levels of traffic congestion and air pollution. Heathrow’s commitment to a ban on scheduled night flights for six and a half hours will be met with scepticism by local residents who too often suffer the breaches of night and day respite agreements. With a third runway, current day-time respite periods will be cut, and another 300,000 people will experience significantly more noise than they do at present. Whilst Heathrow says that noise levels will drop, they are basing this on a rapid fleet replacement which they cannot control. They also ignore the massive increase of noise for residents who will be living under the new westerly approach path. In addition to the detrimental impact that a third runway would have on many of the people living near Heathrow, there are also much wider implications. A third runway would risk breaking air pollution levels as set out in the EU Air Pollution Directive which would have a negative impact on the already poor air quality in London and the surrounding areas.